In this slide deck, I am investigating how our personal identities are being formed on-line, constructed in virtual environments and propagated through the replication of personal digital information. Our identity is transmitted through the diverse landscape of digital media and in a constant state of fluctuation. The meaning of this identity information depends on how our digital personae (images, tweets, texts, status updates, etc.) is viewed, consumed and read by our audience who is often familiar, but sometimes anonymous depending on how much access we grant to our information. One aspect of our virtual identities is their transitory nature, in the same way that Ron Burnett talks about the transitory nature of the meaning embedded in an image, which can morph within the space between the viewer and the object. Above is an image of me with my seventh-grade girlfriend. Many years after this image was taken, a friend shared this image with me through a Facebook tag. I would not have known about this image until this moment of virtual sharing. In some ways, I would not have known anything about “me” from this era, because very little is documented and even less has been archived or replicated as part of my personal history. Once this image was shared, my was identity transformed by this image and my network who were exposed to this image had additional data to base their conclusions about my identity. As the history of this image suggests, it is no longer possible to simply document our being. We must also replicate and share our information to assert our identity and to know these assertions. Through these variables (Information, Vantage Point, Documentation, Replication) I am extending this discussion into the epistemology of knowing oneself, and further, knowing one’s culture. Is the knowledge of self a pattern of information? Is the knowledge of oneself acquired through a process of documenting and replicating this information? Does the context or vantage point in which we view or transmit this information alter how we know ourselves? For the most part, I would suggest the answer is yes for each of these questions. There might have been a time where simply taking a family photo and hanging it on your wall was enough to signify your participation and verify your being. If we use the analogy of a computer, we can no longer capture, aka download, an event to our internal processor for memory and archival purposes. Uploading is also needed to imply being and assert ourselves in the continuum. Uploading, archiving and replicating information informs and shapes our identity, but also guarantees our immortality. In Richard Dawkins‘ book, The Selfish Gene, he explains that genes preserve information by copying the information from one generation to another, spanning eons. Essentially, keeping its data safe by copying itself. He also explains that in the process of replication it also transmits the data for use in making the organism. The information is like a computer program language sending messages from nucleic acids to proteins. The gene does both, replicate information and dictate what form the information should take. We can think of our personal digital information in a similar way as our genes, in the sense that they also replicate our identity codes for preservation and they give shape and form to our being. If we look at the processes of branding and building a brand identity as similar to that of building and knowing our personal identities, we can see that the processes and assumptions are nearly exact. In branding, as well as constructing our identities in the virtual, it is not enough to simply list the defining characteristics of our being, we must also convince others as well. As with identity forming and brand building, it is not what you say about yourself that matters, it is what others say about you. The notion of what others say about your brand or identity relates to the idea of a vantage point. Ron Burnett discusses how the vantage point is always shifting and affects the meaning of an image, and the same is true of our identities. 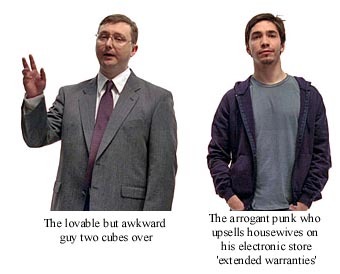 The remixed advertisement (above) from a Mac campaign shows how products try to personify their brands, and then in the remixes below we can see how the vantage point of certain audiences don’t concur with the identity that Mac is trying to simultaneously project onto its end-user as well as its product. The other ways we are shaping our identities through virtual information is through the storage of this information in archives such as YouTube, Flickr, Twitter, Tublr, Facebook, etc. This archival process not only asserts our documentation as authentic and immortal, but it also allows us to replicate and share our information to a broader audience. Lastly, I wanted to look at memes, as a form of genetic code for our culture that helps the culture extend itself and know itself. Burnett talks about the virtual being an extension of reality, and memes are very much an extension of culture’s reality. As with the necessity of virtual infomation being documented and replicated to define our identities, the same is true of memes to define culture. Cultural knowledge is embedded in memes, but they are also encoded and can only be read or understood by small portions of the population. Other memes that are more widely spread are considered viral and either have a common set of universal codes or have minimal complexity in their data structure. Below are a few examples of memes that many members within this class may understand, but the last example, needs other digital references to unlock the meaning. I have included the video, “Friday” and several adaptions of the song that you can explore if you are interested in opening the source of meaning for the last meme. Returning to poststructuralist theory again, Baudrillard argues that meaning and identification are only understandable in terms of how particular words or “signs” interrelate. Memes, brand messages, and our personal data, are all forms of digital information “signs” that embed meaning and identification. 90543041rf8.jpg (JPEG Image, 500×375 pixels) – Scaled (0%), n.d., http://img165.imageshack.us/img165/2861/90543041rf8.jpg. ads-get-a-mac-110706.gif (GIF Image, 400×350 pixels) – Scaled (0%), n.d., http://images.appleinsider.com/ads-get-a-mac-110706.gif. “AppleInsider | Apple ditches ‘Mac Guy’ in new ads”, n.d., http://www.appleinsider.com/articles/06/11/08/apple_ditches_mac_guy_in_new_ads.html. best-pc-vs-mac-ad-2.jpg (JPEG Image, 588×369 pixels), n.d., http://www.watchonepiecepoint.com/wp-content/uploads/2010/09/best-pc-vs-mac-ad-2.jpg. bricks-and-mortar.jpg (JPEG Image, 400×290 pixels), n.d., http://www.zippycart.com/ecommerce-news/wp-content/uploads/2011/04/bricks-and-mortar.jpg. eye_color.jpg (JPEG Image, 400×300 pixels), n.d., http://1.bp.blogspot.com/_8VxI65G2ra0/TKdF4e5SGpI/AAAAAAAAAss/EN7KVNvHHaI/s400/eye_color.jpg. “Gilles Deleuze – Wikipedia, the free encyclopedia”, n.d., http://en.wikipedia.org/wiki/Gilles_Deleuze. “Jean Baudrillard – Wikipedia, the free encyclopedia”, n.d., http://en.wikipedia.org/wiki/Jean_Baudrillard. Katy Perry Performs Rebecca Black’s Friday In Columbia, MD, 2011, http://www.youtube.com/watch?v=JdDFFwLY8Qc&feature=youtube_gdata_player. Katy Perry singing Rebecca Black’s Friday, 2011, http://www.youtube.com/watch?v=sM51ANnSgsU&feature=youtube_gdata_player. “Meme – Wikipedia, the free encyclopedia”, n.d., http://en.wikipedia.org/wiki/Meme. “Memebase: Rage Comics, Forever Alone, Y U No Guy, Troll Face, Foul Bachelor Frog”, n.d., http://memebase.com/. pc_vs_mac.jpg (JPEG Image, 340×274 pixels), n.d., http://pantsinacan.com/wp-content/uploads/2007/04/pc_vs_mac.jpg. Rebecca Black – Friday – Official Music Video, 2011, http://www.youtube.com/watch?v=kfVsfOSbJY0&feature=youtube_gdata_player. Rebecca Black – Friday (OFFICIAL PARODY VIDEO) – Monday, 2011, http://www.youtube.com/watch?v=hZg7EBxbqSE&feature=youtube_gdata_player. Rebecca Black – Friday (Official Video) PARODY, 2011, http://www.youtube.com/watch?v=nVlY3ZTrBkw&feature=youtube_gdata_player. Rebecca Black – Friday SPED UP 5000%, 2011, http://www.youtube.com/watch?v=ANCqiTK8XVY&feature=youtube_gdata_player. “Search Results facebook – Memebase: Rage Comics, Forever Alone, Y U No Guy, Troll Face, Foul Bachelor Frog”, n.d., http://memebase.com/?s=facebook. “The Information: A History, a Theory … – James Gleick – Google Books”, n.d., http://books.google.com/books/about/The_Information.html?id=617JSFW0D2kC. “The Selfish Gene – Wikipedia, the free encyclopedia”, n.d., http://en.wikipedia.org/wiki/The_Selfish_Gene.